Presentation titled “Challenges and Opportunities after Slow Economic Recovery: the case of Serbia” was held on October 25, 2018 at the Faculty of Economics, University of Belgrade. Professor Mihail Arandarenko, Professor of the Faculty of Economics and Chairman of the Board of the Foundation for the Advancement of Economics (FREN) announced Ms. Kori Udovički, an old co-worker and founder of both FREN and CEVES, and currently president of the CEVES Governing Board. The event was attended by representatives of the academic economic community, representatives of the media in the field of economics, students of economic sciences. The presentation gave a look at the economic structure of the Serbian economy and the reasons for growth slower than expected, as well as the prospect of future economic growth. The presentation talked about the structure and competitiveness of the Serbian economy, from the perspective of institutional sectors, defined on the basis of ownership, size and activity of business entities, as well as on dynamics and sources of growth, with a view to the period after the economic crisis. The presentation was organized in cooperation with Foundation for the Advancement of Economics and the Center for Advanced Economic Studies. 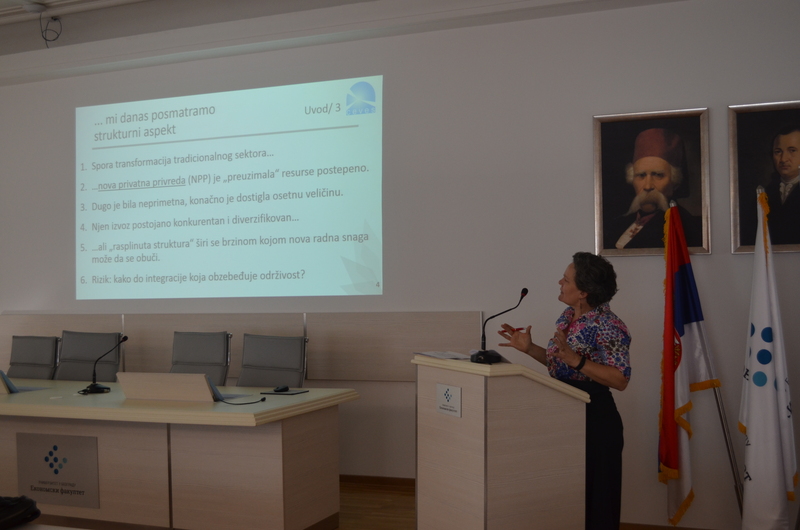 You can download the ppt presentation that was used (available on Serbian only).